In my search for all things Women and Racing, I tend to wear out Google trying to stay updated on all the ladies out there. Believe me, the search isn’t as easy as it seems. After weeding through the hottest driver articles that tend to populate the first few pages of search results, its slim-pickings past that to find the good stuff. So I’ve made it my new mission to seek out and share the relevant sites that cover Women and Motorsports as I find them. This week’s feature is one of the most vibrant sites I’ve found in my recent searches. CarChix.com is a motorsports organization for women created by Jeanette DesJardins. Founded in 2010, the site was born out of an idea DesJardins had as a teenage gearhead, working at her first job as an automotive lube technician outside of Chicago. She envisioned someday owning her own shop, where she felt she could improve many of the things plaguing the industry at the time with a female touch. Sitting outside that shop talking to a friend, she named her future garage Car Chix. Jeanette’s first introduction to motorsports came while she was still in diapers, when her parents and uncle would take her along to Road America in Wisconsin. 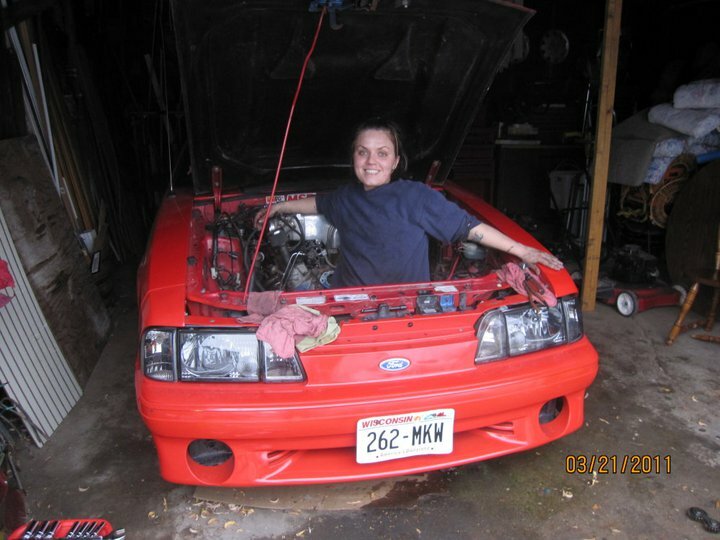 Young Jeanette did more crying from the loud racecars at that age however, and it wasn’t until her teen years that she rediscovered the automotive world. Shortly after purchasing her first car, she was met by resistance from her father, who held the nagging question over her head — How would she afford to repair it if it broke down? Jeanette’s solution: she’d learn to fix it herself, and began taking automotive mechanic courses at the local community college. That training led to her working as a technician at several small garages and dealerships as she moved on to pursue her Associates Degree in Marketing. From there, she landed one of her favorite jobs of all– starting line coordinator and starter at Great Lakes Dragaway in Union Grove, WI. She continued on there, gaining valuable experience in the automotive industry while she simultaneously earned her Bachelor’s in Business Administration and Marketing from the University of Wisconsin. It was during her time there that she launched the website for CarChix.com, initially intended to share photos and chat with other female drag racers at the track. But after just two weeks, the site crashed from the high amount of traffic visiting, causing a change to a forum based system and a relaunch. From there, the site grew, with ladies and men sharing stories from all over the world. She now works as Marketing Coordinator for a manufacturing company in Chicago, as well as, the owner of Crank It Media, an Internet Marketing Company and Car Chix.com. 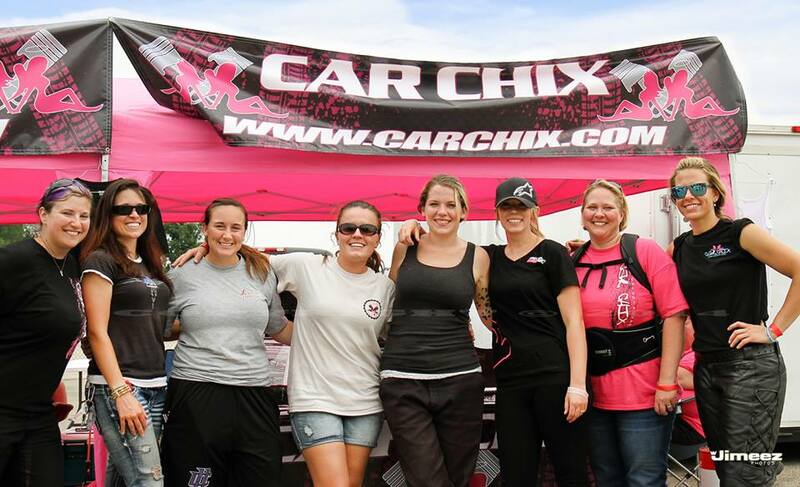 One of the strengths of the CarChix website are the regular news updates posted on female racers careers, including news reports submitted by racers as well as a Featured CarChix of the Month section. Both of these sections make it one of the most feature-rich sites for quality women in racing stories, helping to promote the careers and successes of ladies racing all across the globe. There is even a CarChix store for cool merchandise sporting the CarChix logo and a listing for CarChix sponsored events. 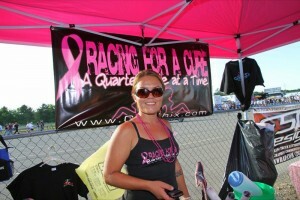 CarChix founder and president Jeanette DesJardins at the 2011 Racing for a Cure event. DesJardins moved onto hosting her first event less than a year after the CarChix.com launch. The event was a breast cancer research fundraiser she named Racing For A Cure a Quarter Mile at a Time, and was held at her home track Great Lakes, to a record-setting attendance. 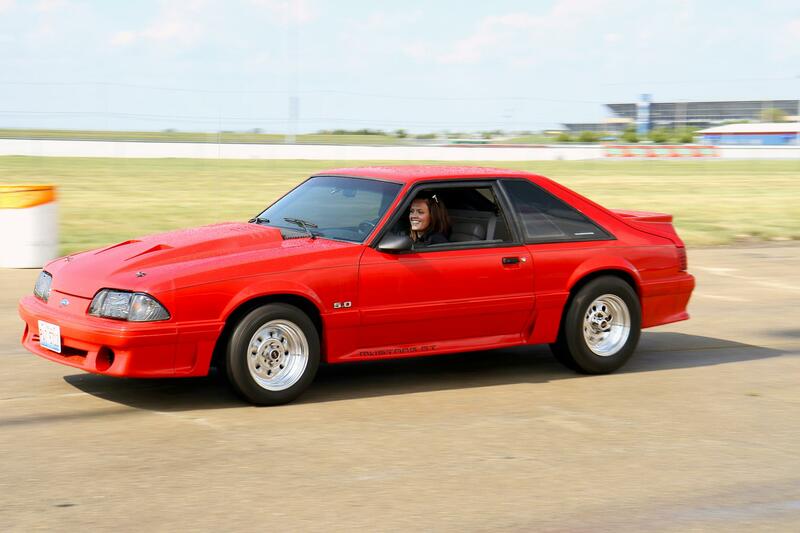 Jeanette arranged an action-packed event, with exhibition cars, wheel standers, drag radial caompetitors, bracket racing, dragsters, raffles, giveaways, face painting, and musical entertainment from a popular band. They raised several thousand dollars for the Wisconsin Well Women Program, an organization that helps women with little or no insurance to receive preventative mammograms and pre/post breast cancer treatments and care. 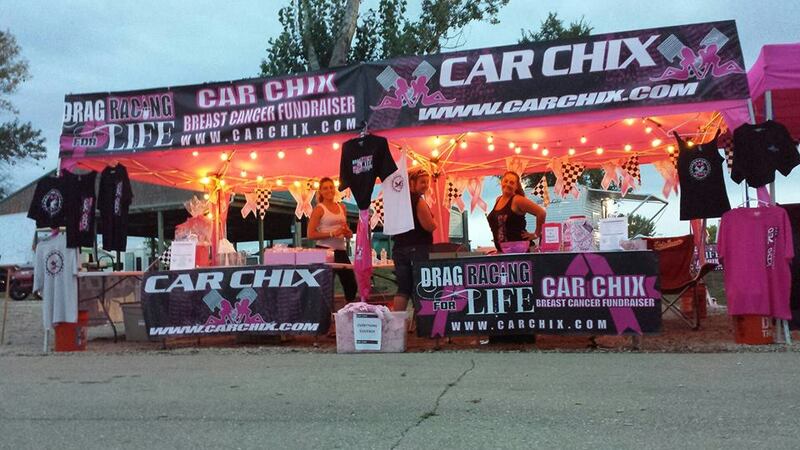 That event, now named Drag Racing for Life, became the first of several annual events organized by Jeanette and the Car Chix program at several locations across the country. She also organized the CarChix Ladies Only Drag Race, an all-female drag racing competition that saw ladies in a variety of race cars compete for prizes and awards, and presented the Hottest Ride Award at the Muscle Car & Corvette Nationals, capping off the year with a Light Up the Holidays parade appearance. DesJardins is currently finishing up the 2015 CarChix Event Schedule, with announcements forthcoming in March on the 2015 dates and locations. Another unique offering to help promote women in racing and female motorsports participants, is the Annual Women of Motorsports Calendar contest. During the contest, women are invited to submit photos of themselves with their rides and seek likes on Facebook. The top 12 are voted into the calendar finalists. These calendars celebrate and inspire women in the automotive industry, featuring cars, bikes and any level of enthusiast. Featured CarChix are often on hand at events to autograph calendars for collectors. Be sure to check out CarChix.com and add it to your bookmarks! Tell them Horsepower & Heels sent you! Have a good site suggestion related to Women in Racing? Send it our way!